Bantam Tools™ Desktop Milling Machine Software has support for custom tools. When you create a custom tool, you can choose the cutting diameter, and the feeds and speeds that the software will use when this custom tool is selected. This guide covers the basics of adding and removing custom tools, setting custom speeds and feeds, and importing/exporting your tool library. The Tool Library is the software’s database of custom tools. You can use the Tool Library to add new tools, edit tool settings, and import or export your entire tool library. Why would I want to add tools? Although Bantam Tools™ Desktop Milling Machine Software comes configured with all of the standard cuttings tools we offer, there is an entire universe of milling tools in the world. You might prefer to use metric tools, tools from other suppliers, or tools with different geometry. Or, you might want to set custom speeds and feeds for a tool (i.e. if you purchase tools from an alternative manufacturer.) Adding a tool to the software’s Tool Library makes this easy. Once you’ve added a new tool, it will be available in tool selectors throughout the software. In particular, the tool will be an option during the tool change process, and it will be available for use on PCB, SVG, and G-code plans. The software uses your tool definitions in two key ways: to create toolpaths and to calculate the 3D preview that account for the shape of the tool. What kinds of tools can I add to the Tool Library? 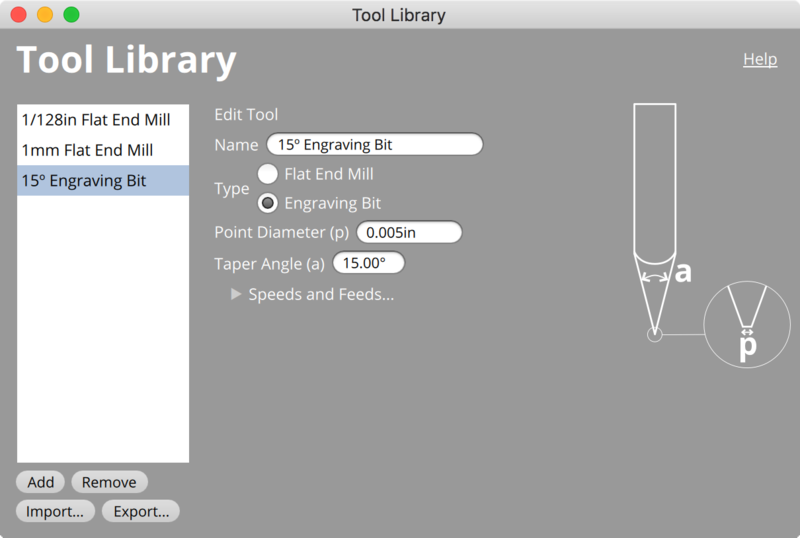 Currently, the software supports custom Flat End Mills and Engraving Bits. the software does not yet support custom Ball End Mills, Drill Bits, or other types of tools. The software supports tools defined using either millimeters or inches. What should I do if I’d like to use a type of tool that isn’t supported by the Tool Library? 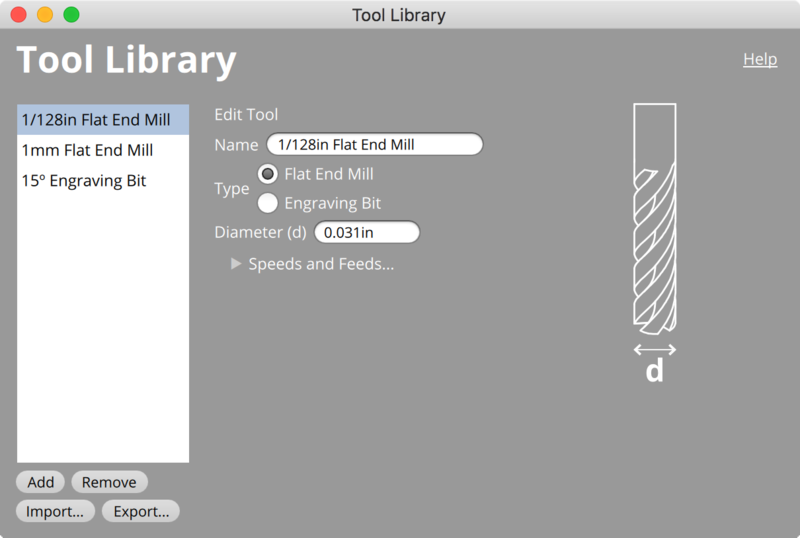 As the software is only able to create toolpaths for flat end mills and engraving bits, these are the only types of tools supported by the Tool Library. If you’re using G-code files, there is a workaround to support other types of tools (ball end mills, chamfer bits, and so on). Simply select “flat end mill” for these tools, and give the tool an appropriate name. Then, make sure to select this tool for the appropriate toolpath in your G-code plan configuration panel. Using custom tools with imported G-code offers some advantages: your custom tools will be used for generating a 3D preview that more closely matches your design, and tool change prompts will reflect any custom tools you’ve selected for the job. Keep in mind that using custom tools in this way for G-code files will not change your motion plan, since you’ve already accounted for tool size and speeds and feeds as part of the CAM process. However, the 3D preview will be calculated based on the shape of a flat end mill, and will not match the final milled part. How does the software set speeds and feeds for custom tools? 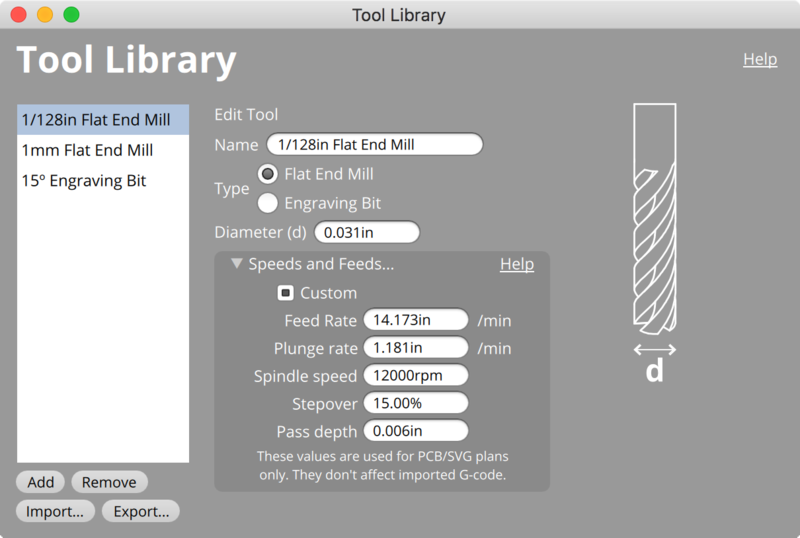 When milling a PCB with a custom tool, the software calculates speeds and feeds based on the settings used by the default tools. You can also specify speeds and feeds for custom tools. If using material other than FR-1, custom speeds and feeds will be necessary for best results. Finally, keep in mind that tool characteristics differ between manufacturers, so if you are using tools from a source other than OMC, custom speeds and feeds may be necessary. How do I open the Tool Library? With the software open, click File > Tool Library. You can also use a keyboard shortcut: Control + T on Windows and Command + T on Mac. If the Tool Library isn’t already open, click File > Tool Library to open it. Enter a name for the tool. Select the tool type. Currently, the software supports Flat End Mills and Engraving Bits. For Flat End Mills, set the diameter of the tool. For Engraving Bits, set the angle of the tool and the tip diameter. Note: You can enter tools in either Metric or Imperial units. To switch units, click View > Show Units in Inches or Show Units in Millimeters. Optional: Enter custom speeds and feeds for the tool. Click Feeds & Speeds to show the Speeds and Feeds settings. Set the appropriate speeds and feeds settings. Please read the Speeds and Feeds guide for information on how to configure these settings. The new tool will automatically save and be available to select elsewhere in the software. How do I remove a tool? In the tool list, select the tool you wish to remove. How do I export my tool library? Navigate to the location where you’d like to save the tool library and give it a name. The software will save a .json file containing all of the tools in your library. How do I import a saved tool library? Find a tool library export file, with a .json file extension. The software will add all of the tools in the imported tool library file to your tool library. Note: if you attempt to import a tool that already exists in your tool library, the definition will not be updated.